Making the decision to seek out counseling is a very hard and personal one. Searching for the ‘right therapist’ who is the best fit for your situation and needs can feel like an Olympic event. Maybe you have found the ‘perfect’ therapist for your needs or you are throwing a dart at a board and picking one on impulse. Either way, you have FINALLY decided it is time to make that call! Now all you have left to do if figure out how to pay for it! Sound familiar? After making this decision you then begins the journey through understanding who is covered, primary/ secondary policies, deductibles, co-insurance, co-pays and covered services. Let the headache begin! If you are researching coverage yourself keep in mind that policies can have a lot of variation in them and your best move is to call your insurance company itself. Before you pick up the phone take a moment to write down your questions (or print out this list) and grab a pencil to take down their answers. There is nothing more infuriating then hanging up the phone and realizing that you forgot to ask something or, even worse, forgot what their answer was! Is the therapist I am considering ‘in network’ with the insurance company? Can they give me a list of therapists that they do cover? What is my deductible and have I already met it? If the therapist I want to see is not In-Network ask if you have Out-of-Network benefits for counseling? At what percentage are the counseling fees reimbursed for Out-of Network benefits? At Angelus Therapeutic Services we understand that you work hard for your benefits and naturally assume that when you need to use them that it will be a simple process. Our practice is insurance friendly but we have learned firsthand how confusing and overwhelming insurances and reimbursement can be and are here to help you walk through this process. When you come in for your session you will be responsible for paying your portion of session costs at the time of your appointment. You are welcome to use a credit card on file, HSA Card, cash or check. We have a contract with each of our In-Network insurance companies with a set rate per session that may be different from our standard session rate. If you have a deductible or coinsurance it will be based on this contracted rate rather than our standard rate. We will generally be able to give you this information up front. There are times where we will charge you the co-pay or coinsurance amount but the insurance then applies your session to your deductible and you would then be billed for that remaining portion (This is why it is great to ask your insurance all the questions above up front-No Surprise bills!). If we are not In-Network with your insurance but you do have Out-of Network benefits you will pay our standard rate at the time of your session and you will then be given the necessary form (it’s usually called a Superbill) for reimbursed by your insurance. As a courtesy, we can submit this for you if it is a policy that our system is linked with. If not, there are great programs out there, such as the “Better” app that will do all the leg work for you to get these reimbursements. As always, we are here to help, if you have questions or concerns about this process feel free to get in touch with us today! 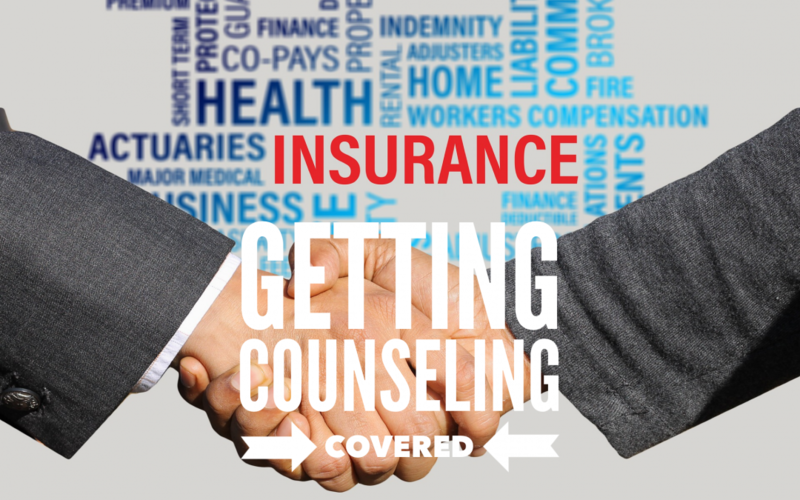 Don’t let insurance confusion stop you from getting the counseling you need.